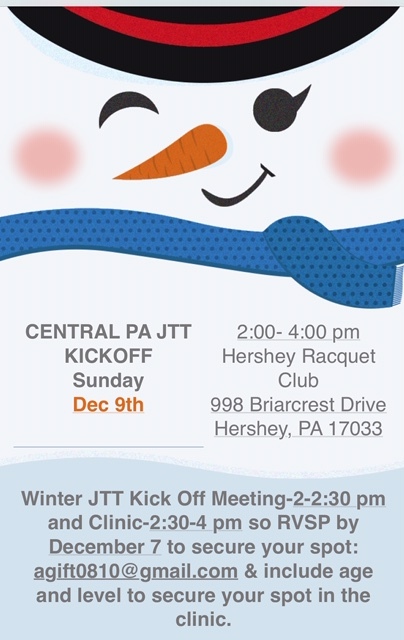 Join the fun with a free junior clinic from 2:30 to 4:00 PM at Hershey Racquet Club on December 9th. Captain's meeting for Captains, Parents, Coaches, and High School Captains from 2:00 to 2:30 PM. RSVP by December 7th to reserve your spot at centralpajtt@gmail.com. Details: Contact April Gift by completing this form or by phone at 717-574-4841 for more information. Noli Nacionales 18U Intermediate team, Full Metal Racquets, are advancing to Sectionals in Princeton, NJ on August 2. Pat Smith's 12U Green Dot team will also advance to Sectionals on August 3. Congratulations to both teams on advancing to the next stage and thank you for playing Central PA JTT! !